A brief history of Kabala, charts of the tree, ideas about its meaning, and a bibliography/suggested reading list. Eliphas Levi said the Tarot is a "Lottery of thoughts;" another way to see it is as a collection of dream images or archetypes. The interlocking of Tarot and Qabala (a controversial technique - see below) creates a mnemonic (aiding the memory) device for bringing order to these symbols. "Sepher," in Hebrew, means "book," or "number." It is related to our words "sphere," "cipher," and "sapphire." In addition, "Sippur" means to teach, tell a story, or impart. Qabala originated in Judaism, but has been adapted to numerous other religious systems. There were Christian Kabalists, most notably the mystic Jacob Boehme (1575-1624), whose writings influenced the nineteenth-century magicians who led the Golden Dawn, which became known of as the "Western Mystery Tradition." The interpretations in these pages derive from a combination of the Western Mystery tradition, Judaic tradition, and contemporary astrological analysis. 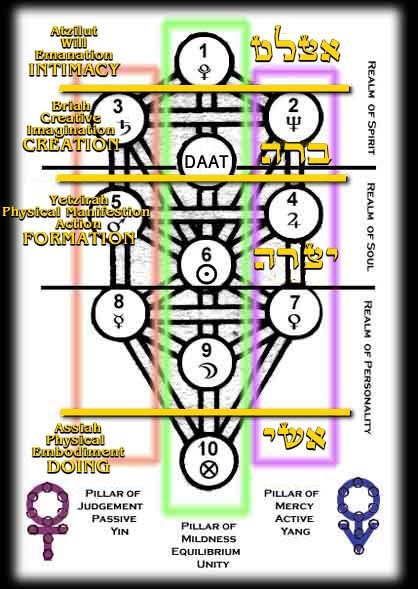 Complex genealogies trace varying threads and histories of Qabalah, also often rendered as Kaballah, Cabala, et al. The fact is, faithful of any religion, or even total atheists, can find Qabala useful. Even the most hardened existentialists have to admit to mental states; things like ambition, enthusiasm, awe, gratitude - all conditions mapped in the Tree of Life. Qabala (Hebrew verb root QBL - to receive or accept) is a system of thought - a way to correlate a variety of archetypes, each symbolizing a different aspect of living. It correlates a multiplicity of different approaches, widely separated from one another and sometimes completely contradictory. Psychology, Tarot, mythology, theosopy, dreamworking, astrology, numerology, poetry, and geometry all harmonize in the Tree of Life. The Tree is a map of personal energies and thought. It is a "filing system" for our mythologies, histories, dream archetypes, and more. It is a way for us to visualize the un-vizualizable, to describe the ineffable mystery. With our limited consciousness we must accept that any such description can only be metaphor, only an approximation. It is a way to bring balance and harmony into life. In the sephirot, one can see where imbalances have developed, and can do 'pathwork' or 'active imagination' rituals and exercises to bring balance. For example, in dealings with the world, we can "use a touch of Gevurah [judgement | discipline] , and a touch of Chesed [mercy | generosity] , to a point of Tiferet [beauty]" which is what we present to others. 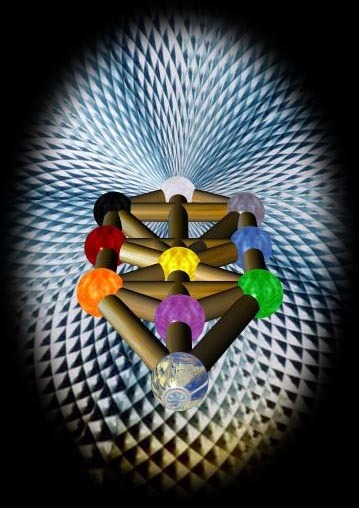 Kabbalah is a tradition that requires great patience and stability. It is a journey of small steps, gradual learning, and fundamental changes. One of the reasons for this slow tempo is that everyone has to mature their potential gradually, thoroughly, and at a natural pace. In this way the student's work unfolds at the right moment and at the right time. Qabala is relatively new, though the notion that it is a reconstruction of the lost knowledge of the ancients adds to its appeal. Some say the 10 commandments given to Moses on Mount Sinai are the same ten Sephirot in the Tree of Life. Egypt is also included in the patronage. Either way, it is a valid and engaging meditation device. Yet another way of seeing the Tree is as a way to describe "God." It's well known that our minds are incapable of defining or describing "God," so the Etz Chaim begins to provide a glimpse, or a map, of that mystery we want to know and contemplate. 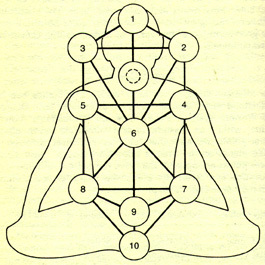 Each of the ten spheres (also called 'paths') is connected by at least three of the 22 paths. Each of the paths is identified with A) a letter in the Hebrew alphabet, B) one of the 22 major Tarot trumps, C) a Zodiacal sign or body, and D) any number of other mnemonic triggers, like fragrances, metals, gems, magical weapons, animals, Egyptian, Nordic, or Greek gods. There is even a system for dividing the Lord's Prayer into the ten Sephirot. The spheres are static psychic energy, while the paths are dynamic psychic energy. To make an analogy to language, we could say that the Sephirot are nouns, and the paths are verbs. The connection of the 22 'Major Trumps' of Tarot to Qabala is controversial. It was first concieved by Eliphas Levi, in the nineteenth century, and is definitely a non-Jewish phenomenon. The cards were originally used for games, and the adoption of the images by Qabalists is similar to psychologists' Rorschach ink blots. As mnemonic devices, Tarot images are optimal. Differing ideas about the path/card attributions switch around certain cards - here the system is that of the Order of the Golden Dawn. In the context of Qabala, the Tarot cards are NOT used for 'divination,' or fortune telling, though knowledge of Kabbalistic principles will no doubt enhance the experience for Tarot readers. The Tarot cards can be seen as 'scenarios,' or 'dream states,' that characterize the particular lesson of that path. The images in the cards remind and make tangible the particular transformation being wrought. In the frame to the left, click on "Reveal" to show the correspondences drawn on the tree. To see maps of the letters, signs and bodies, click on the "Aleph." On any of the trees or glyphs, you can click on the sphere, path, or glyph to see the Tarot trump and other details in this frame. If you don't see a frame to the left, click Here. It is usually advisable to begin and end Qabala meditations in Malchut, or Key 21 to stay grounded. Not doing so can lead to a terrifying unrootedness. Here is an idea for such a meditation, called Invocation of the Orchard. Keter, or Keter Elyon, is the first receptacle of pure essence from the infinite; called "en Sof Aur," (Light Without End). As the light works its way to our world, Malchut, it passes through the intervening spheres. The process of emanation is as if one candle were lit from another without the Emanator being diminished. These stones of fire show a map of consciousness, in the macrocosmos, and the microcosmos. Before emanation, creating the possibility of a universe, is Tzimtzum, the "Great Contraction." The "Male/Female" polarity suggested is not as simple as it seems. The Tree blends energies, as it purifies them. Click here for a look at an example of "churning" in the Tree. The Tree of Life, in its interconnectedness, also teaches about the interlocked nature of reality, and how a change in one area affects all of the other areas. 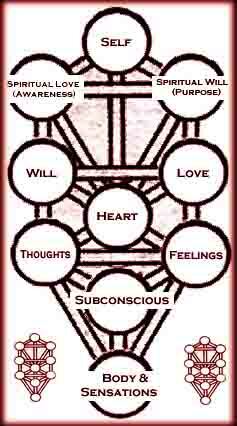 Ets Chaim, the Tree of Life, is a morphogenetic field, based on harmony, and balance. An almost endless variety of geometric patterns can be seen in its paths. Atzilut is where the Creator acts directly and not through ministers. In Briah , God's actions are through mediation of archangels. In Yetzirah are the "single-purpose angels," those angels that co-exist with every entity and action. In Assiah , Creator acts through the "mundane chakras," the elements, planets, and signs of the Zodiac. The Sephirot can be grouped in many ways. One system creates three categories: Conceptual (rational), Active, and Tactical. The conceptual or rational sefirot are chochmah, binah and daat. The active sefirot are chesed, gevurah and tiferet. The tactical sefirot are netzach and hod. Chochma is inspiration, ideas and creative thought, the seed; Binah takes these ideas and subjects them to deduction, analysis and development, the womb; Daat is the concrete result, the Child. Chesed is unprompted, unrewarded giving; purity of motive; it is the first step of action; it is not a reaction to any previous deed. It is an act parallel to creation, an act ex nihilo. Chesed is the relationship of God to human. Gevurah is limitation and restraint that builds character. Gevurah is "no free lunches." Chesed and Gevurah work together, though in opposite directions, like one hand sawing the board and the other holding it steady. Chesed is Love, and Gevurah is Fear (the precursor of Awe). Tipharet is not compromise, but integration of Chesed and Gevurah, creating Beauty. Netzach and Hod are often not what they seem. These "tactical" Sephirot have no purpose inherent in themselves, but rather as a means for something else. The Tactical Sephirot process the impulses coming from above, taking from the opposite side. Netzach modulates Gevurah, and Hod modulates Chesed. Netzach is the Victory resulting from Strength (Gevurah); Hod is awe in the face of hidden spirituality or power (Chesed). (See Tree/Helix). Da'at is a "conjectured" sephirah. It is said to represent the throat as seen in the diagram below. In Hebrew, Da'at is "knowledge, perception, or learning." It is not really a sephirah; it is a "result" of it's location on the Tree of Life. It is midway on the longest path, and central in the upper hexagonal array. Binah and Chochma straddle the polarity between undefined knowledge and differentiation; Keter and Da'at straddle the polarity between cosmic consciousness and individual consciousness. Da'at really is knowledge in the "Biblical Sense-" it is the focal point of the mystical union that is prescribed for sanctified couples to perform on Shabbat night. It is the Song of Songs, Solomon's love poem of yearning for closeness to the Creator Before Time, consummated at the darkest hour, and anticipated in the K'Gavna prayer, read in the Kabbalat Shabbat service, at sunset, hours earlier. Qabala allows for and has generated myriad interpretations. Many images are used as metaphors for the Tree of Life. The spheres have been compared to mirrors, each reflecting the same light in a different way. The spheres are also compared to costumes or 'skins' of the Great Spirit, preventing the student from the blinding light under them. The Tree of Knowledge of Good and Evil and the Tree of Life are the same. One story has it that the upper realms of the tree are the Tree of Life, and the lower realms are where the Good and Evil part comes in. This leads to the Garden of Eden metaphor, and the notion that the "Fall of Man" is timeless, and that we are always/never "Back in the Garden." Another interpretation (Sforno) says that the "Tree of Knowledge of Good and Evil" is such a test because it mixes the two. If the tree had been totally evil, Adam and Eve would have known right away to avoid it, but since with was "Good AND Evil," mixed, it brought doubt into the world. Suddenly it wasn't so obvious what was the right path. Self-deception became possible. The self-deception is shown in Adam and Eve's first action after they eat of the tree: to put on clothes and to hide from God. Both of them had been in intimate contact with the Eternal, and knew they couldn't really hide, and that God could see right through their fig leaves - but having learned self-deception they tried anyway. The Tree is beyond time and space - emanation occurs in an infinite dimension. The glyph of the Tree itself is for our convenience. There are many ways to 'draw' Emanation, one is to nest the spheres like an onion, or multiple trees, another is called the "Cube of Space." The Sephirot are like rungs of the ladder, connecting Earth to Heaven, time to timeless, now to forever. The Tree describes the incarnation process. The soul begins unified with source, at Malchut. The individuation process begins with the Hod/Netzach split, Key 16. This could be compared to the loss of childhood innocence. It is the start of separating desire: desire to pull away from Source into individuality. The process continues up the tree into the realm of soul, and then Spirit. Finally, the separating desires exhausted, desire for return to source results in unity, at Keter. Karma is a product of desire - the Tree describes Karmic interplay. Desire dictates each individual's reality - affecting the choices we make based on what we think we need. Our choices result in actions, and we reap what we sow. The root of the Tree, Malchut, is our connectedness with earth, and a sense of tradition. The "body" of the tree is the work we do, the Karma we incur, the Karmic debts we pay, and the blessings and healings we bestow. The result is the fruit at the top, Keter. The Tree is an "alembic-" a chamber for containing and observing chemical reactions, and for isolating compounds. The alembic was originally a tool of alchemy, or for distilling liquor. The ingredients go into one end, go through complex processes, and come out the other end purified. Qabalistic discussion of the problem of evil is a key difference from mainstream Jewish thought, which gives little emphasis to the subject. Severity and judgement, Gevurah, without any tempering by kindness and mercy, is seen as a source of cruelty. "Imbalance" becomes "evil." By the same token, excessive Chesed - a total lack of discipline for example, can lead to great distress, or "evil." "Good" is the inclination of moving up the Tree, towards the Source; "Evil" is the inclination of down the tree, away from Source. Others say that evil is the 'husks' or 'klippot' that fall away from the light as it passes into manifestation, like slag burning off of a crucible. These kelipot are also like shells, that obscure the light, or prevent intimacy. This site is partly anthology; the compliation and synthesis, though, has created a whole greater than the sum of its parts. The Spice of Torah Gematria by Gutman Locks :: 1985 Judaica Press, New York. The Illustrated Key to the Tarot - The Veil of Divination by L.W. de Lawrence :: 1918 deLawrence, Scott, & Co.
Astrology - a Cosmic Science by Isabel Hickey :: 1970 Altieri Press, Bridgeport, Connecticut. The Golden Bough :: By James G. Frazer :: 1981 Avenel Books :: New York, New York. Beneath A Vedic Sky - A Beginner's Guide to the Astrology of Ancient India :: By William R. Levacy :: 1999 Hay House, Inc. :: Carlsbad, California. Also, many thanks to Mary Love, for her profound insights, a peek at her notebooks, and her patience.